September 14, 2016 – Montreal: MPB Communications Inc. is among three organizations sharing third prize in the prestigious Berthold Leibinger Innovationspreis. Awarded September 9, 2016, MPB Communications, the European Southern Observatory, and Toptica were recognized for their joint work on Guide Star Lasers for ESO’s Very Large Telescope (VLT) and other Large and Extremely Large Telescopes (ELT). This new Guide Star Laser technology uses powerful fiber lasers to create artificial guide stars, which allow the Adaptive Optics (AO) systems in the Very Large and Extremely Large Telescopes to compensate for the blurring caused by the Earth’s atmosphere, making way for the sharpest images of celestial objects available from ground-based telescopes, in fact, surpassing the image quality of the Hubble Space Teslescope. The ESO-Toptica-MPB system is currently installed at the Four Laser Guide Star Facility (4LGSF), on ESO’s VLT, where four guide star lasers join together to create the most powerful laser guide star system in the world. 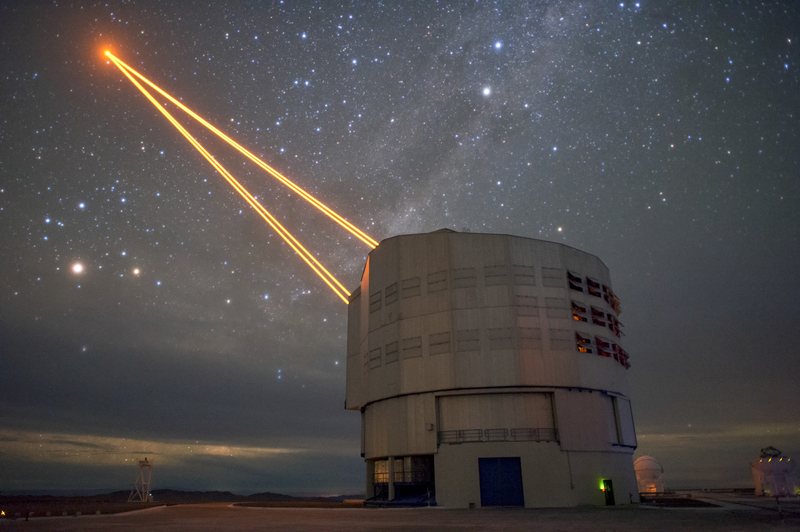 Located at the Paranal Observatory in Chile, all four lasers saw first light in April, 2016. Each Guide Star Laser shoots a continuous-wave, high-power (25 W) laser beam at 589 nm to the upper atmosphere, making sodium atoms at an altitude of ~90 km glow, creating a bright artificial star that is used as a reference by the AO system sensors to determine the deformation of the telescope’s AO mirrors to compensate for the atmospheric blurring. The technology used in this system offers a brighter “star”, increased system stability and reduced preventative maintenance, support and preparation compared to alternative Guide Star Laser technologies. MPB Communications Inc. is a privately owned company specializing in high technology products, systems and services. Since its formation in 1976, the company has expanded into a number of technology-based areas of expertise: fiber laser products, photonics and optical fiber communications technology as well as services in the area of compliance testing of products. The Berthold Leibinger Innovationspreis honors scientists and developers who make advancements in the field of laser technology. Since 2000, the Berthold Leibinger Stiftung has given the award every two years for excellent research and development work on the application or generation of laser light.